There are literally thousands of varieties of dahlias available. Dahlias are native to Mexico, and hybridization began in Mexico in 1789. By the late 1800s the majority of today’s dahlia cultivars had been developed. Dahlias are tubers--the nutrient supply is stored in the root or tuber itself--as opposed to an enlarged stem. Water requirements are determined by the stage of growth of the dahlia (when first planted, when sprouts appear and when the plant is established). Dahlia tubers need to be planted in the spring, and dug up in the fall and stored. Then they are replanted in the springtime. Their shoots are extremely sensitive to frost, and the recommended planting time is two weeks before the last spring frost date, according to the National Gardening Association. The tuberous roots of the dahlia are shaped like small sweet potatoes. The plant reproduces by buds that appear at the upper end of the root. The tuberous roots are divided to create additional plants. They can be divided (in halves or quarters) in the fall or spring, according to the Portland Dahlia Society. Care should be taken when dividing the dahlias to ensure that each root has an eye. Eyes of the root structure are located on the center stalk or stem. Be aware that each root may not have an eye. If they don’t have an eye, they will not grow, and can be discarded. Dahlias need to be planted in loose well-drained soil. (Soil that does not drain well will cause the tubers to rot.) If the texture of the soil is heavy, add sand or peat moss to loosen it up. Mix a small amount of bone meal into the soil/planting hole before planting the tuber. Dahlias do well in light acidic soil, with a pH of 6.5 to 7. Do not water the dahlia tubers after planting them in the springtime. Rainwater will be adequate. Once the plants begin sprouting, you can begin watering them. Young plants do not require much water. As the weather turns warmer and dryer, they will need to be deeply watered once a week--twice a week if you've had less than an inch of rain or very hot temperatures. 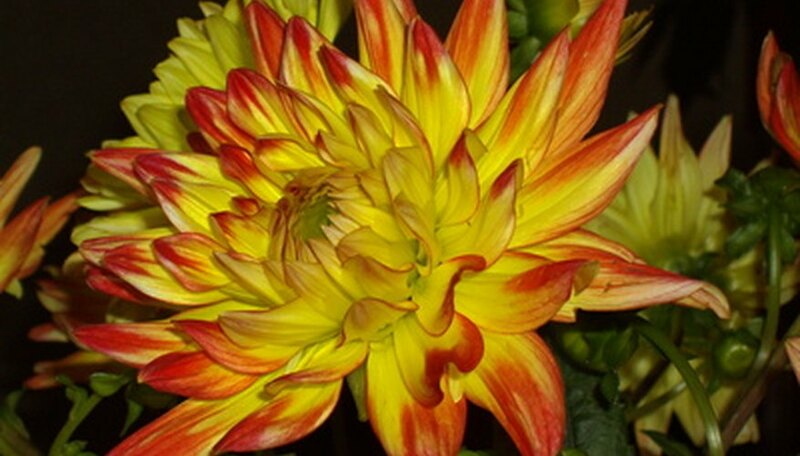 Dahlias are classified by the shape of their flowers. Semicactus are dahlias whose flowers are less than 4 inches across and up to 10 inches across, while the pompon dahlias have flowers that are less than 2 inches across. There are 16 groups or classifications of dahlias.